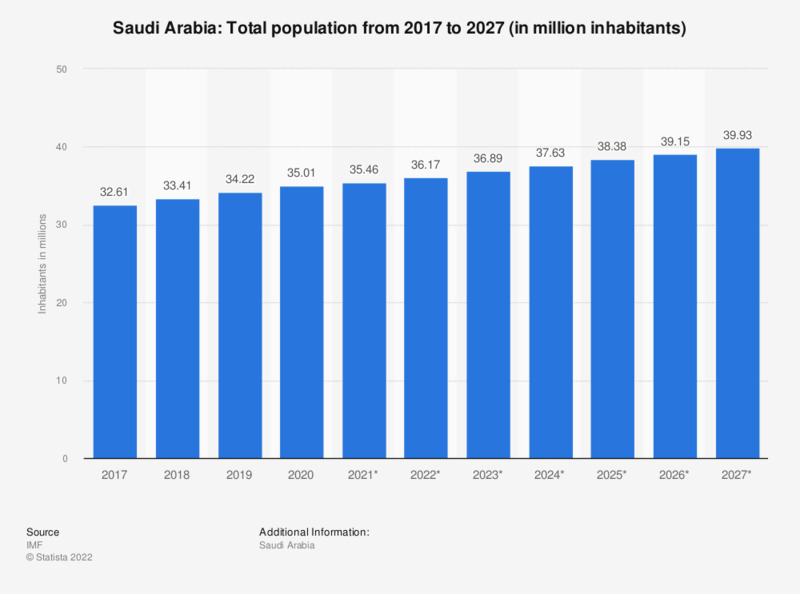 This statistic shows the total population of Saudi Arabia from 2012 to 2017, with projections up until 2022. In 2017, Saudi Arabia's total population amounted to 32.55 million inhabitants. Saudi Arabia, the second largest Arab state, is a nation in development. As a result of the economic stability, gross domestic product (GDP) has grown by about 520 billion U.S. dollars over the past decade. This comes as a result of Saudi Arabia’s positive trade balance and the fact that Saudi Arabia exports about 2.5 times more goods than it imports. Therefore, it is no surprise that Saudi Arabia has constantly had a very high GDP growth in the past decade. In a developing country, there is a tendency for the population to move to more urban cities where the employment rates are higher. The degree of urbanization in Saudi Arabia has grown by around 2 percent from 2002 to 2012. Some of the biggest cities in Saudi Arabia have witnessed the urbanization changes first-hand. The capital of Saudi Arabia and the biggest city, Ar-Riyad, is home to about five million inhabitants. However, the high number of illegal immigrants in Saudi Arabia also accounts for the total population. More awareness to health risks and better living conditions have increased the life expectancy at birth in Saudi Arabia by about 3 years in the last decade. With a rapidly growing total population, it has grown by around 8 million inhabitants over the past decade, the government has set some rules to avoid overcrowding and overpopulation. The fertility rate in Saudi has steadily decreased over the past years in order to attempt to control the rapidly growing population.